It has been a very busy week, and health wise not good too. Have been having such a severe Migraine, I think I have taken so much pills in this last week and on top of it, had a Memorial Concert here for WW1 so feeling good or not had to be busy for that. Must admit had bad days and good days. Posting a video of one of the music piece Shyama and Hans performed for the concert on Friday. Now to the recipe, I think I must have made this dish atleast a year ago. I have noticed latley I don't take any pictures of the dishes, I make so I had to go and look into my old file to see if I can post something, which is not a worry as I have so many pictures and recipes to post in my map. This is a easy recipe, It is nice to serve this when you have a party as a salade etc.....as this dish is served cold. I mostly serve it when i do meat fondue or you can do when you have a barbacue. 225 gm tomatoes , skin removed﻿, and seed removed chopped fine. 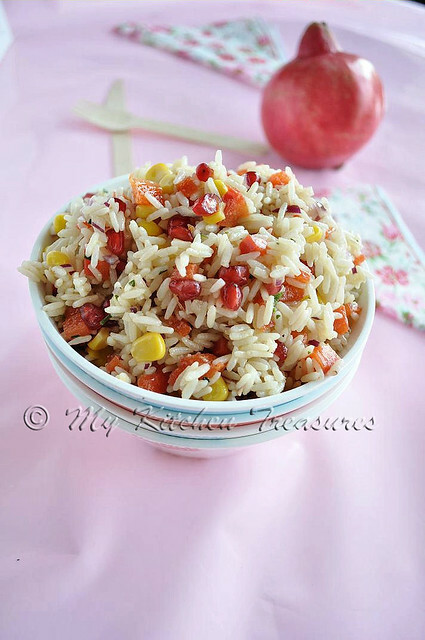 Add the rice into a large bowl, then add the spring onion, capsicul,tomatoes,corn, popegrante, and corriander. Mix all the ingridients for the dressing in a small bowl and pour the dressing into the bowl with rice and veg. Cover the salade for 1 hour in the fridge and then serve. Colourful and super delicious salad. Awesome, Congrats to H & S - they performed well! The rice is delicious and colorful. Looks very tempting.... and so colorful!!! Your pictures are amazing!!! This rice looks delicious!!! The rice looks really appetizing. Love the colour. Congratulations to Shyama and Hans. How colourful! I missed blogging - no Internet at home for 15 days and even now, it's not working properly. Beautiful color of the salad. Will listen to that video a bit later. Did Hans play a Rabindra Sangeet ? Looks colorful. I've never tried a rice salad. Sounds interesting. Bongmom they played 2 pieces . wow! this rice looks so healthy & colorful! If you can, please go through the rules of my Healthy Lunch Challenge & link your post there. Thanks! I hope you will be feeling better really soon! The video was good!! Congrats to H & S! The rice dish is a delectable one! 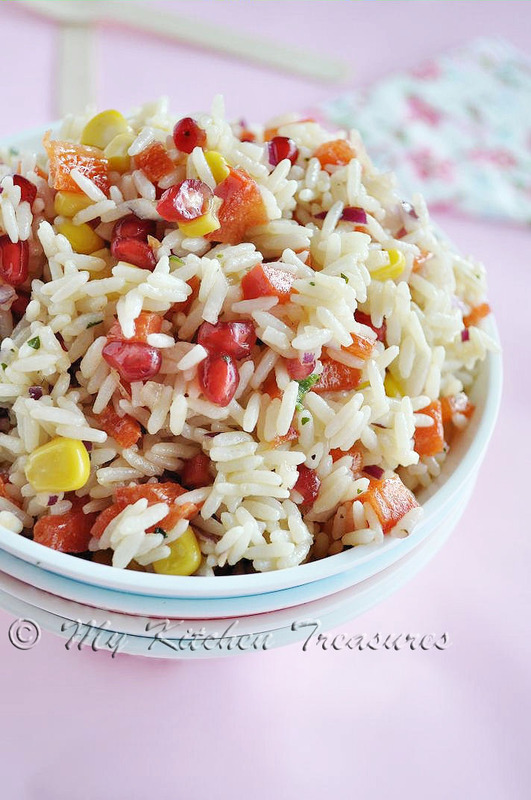 This is the prettiest rice dish ever! Beautiful! Love the fresh and vibrant pomegranates in this.